I'm lucky to live minutes from one of the best motorcycling areas in the U.S., an area which is also a relatively well-kept secret. Leave it to my favorite motorcycle touring publication, RoadRUNNER magazine, to "discover" this area and blab it to the world! 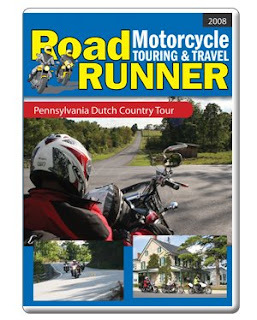 RR recently released a DVD about motorcycle touring in the "Pennsylvania Dutch Country" of south eastern/central Pennsylvania. Publisher Christa Neuhauser enthused that, "If riders liked our first motorcycle touring DVD, they're really going to love this one! Bucolic countryside, twisty tarmac, fascinating attractions, interesting people, humorous encounters, evocative cinematography and the frozen-in-time Amish culture all make for possibly the most entertaining motorcycle tour ever captured in a video." Selling for $19.95, you can order one here. Now that the jig is up, maybe I'll see you on the road someday soon!